Rugs A Bound recommends a rug pad with every rug. This reversible premium rug pad will protect your rug on a hard surface or on carpet. Not only will this dense pad keep your rug in place; it will also provide a firm base for your rug and make vacuuming easier. 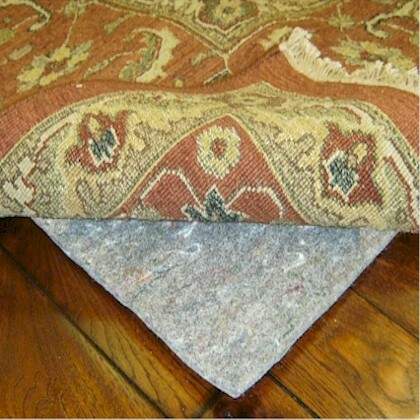 As the pad extends the life of your rug, it will also protect your wood, laminate, tile, vinyl, or marble. The rug pads are cut 3'' shorter on each side of the rug, so that when the pad is centered underneath the rug, the rug will lay down properly over the pad. For example, an 8' x 11' rug pad will measure 7'6'' x 10'6''.